Earlier this month, a ‘Body Volume Indicator’ app was launched to slay the Body Mass Index for good. But while the BVI was hailed as a vast improvement over the often inaccurate BMI, the app had one problem: It wasn’t accessible to everyday men and women (at least not yet). To measure your volume of body fat, visceral fat, abdomen volume, waist-to-hip ratio, BMI, and your unique BVI number, you’d have to make an appointment with a doctor, exercise physiologist, or dietician who has the BVI Pro app—not exactly a useful metric if you’re trying to track your progress day by day or week to week. Now, a new piece of tech has appeared to fill that void: the ShapeScale. Open now for pre-order and set for delivery in spring 2018, the ShapeScale scans your body and digitally recreates your dimensions to create a 3D picture of your physique. Over time, the scale can track those body scans against your weight changes, giving you a precise, measurable indicator of your progress as you lose weight and build muscle. You start by standing on the scale (easy enough). In less than a minute, ShapeScale’s arm revolves around the central stand, spiraling upward as it scans your entire body using infrared light and a camera snapping hundreds of pictures. The device then creates a digital rendering of your body and its proportions. Noteworthy: You don’t need to be naked to use it, but the company recommends you wear tight-fitting clothes to get more consistently accurate scans over time. With the ShapeScale’s accompanying free app, you can see the exact dimensions of your chest, arms, legs, and waist. You’ll also get a glimpse at any discrepancies and imbalances in your arms and legs. To be fair, this tech isn’t exactly revolutionary—previous body scanners did something similar, although you’d have to stand on a rotating platform and try to stay still as the stationary scanner did its thing. On those old models, though, changes in lighting altered the accuracy of the readings, and most men and women felt a tad self-conscious standing half-naked on a rotating platform in front of their fellow gym-goers. 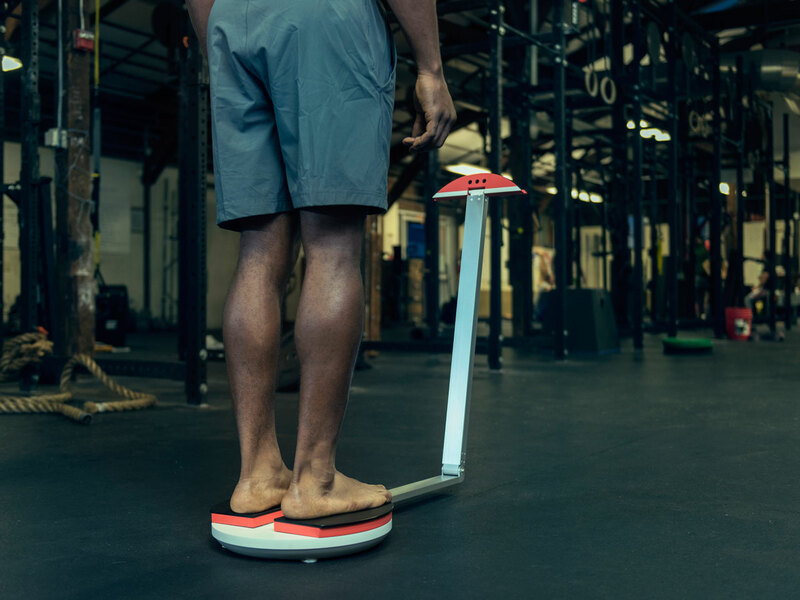 Because it tracks both your weight and the shape of your physique, the ShapeScale can show you your “localized lean mass” and “localized body fat” measurements. So, rather than getting the obtuse BMI measurement, you see exactly what areas are holding on to fat. In fact, that’s where we believe ShapeScale will really hit home with consumers: Visuals are stronger motivators than numbers, especially because you can be blasting away fat and steadily gaining muscle, but the scale may never budge. That’s defeating for many people trying to transform their physique—especially if they’re not taking before-and-after photos. With the app, you can select two dates—like Day 1 of your weight-loss or mass-building protocol, and then again on Day 14—and see how and where your body’s changing, via the app’s heat maps. Orange and red areas flag growth, whereas blue and green areas reveal loss. You can also use the “Difference View” to see how far your problem areas have come, like where your belly was on New Year’s Day versus the first day of beach season. You can even set up goals and track your progress. Say you’re training for a bodybuilding competition, getting in shape for your wedding, or just trying to scuplt a leaner physique. ShapeScale guides your efforts and lets you know how much more you have to work to accomplish each checkpoint, whether that’s pumping up your biceps or whittling down your love handles. Ultimately, the ShapeScale is easy to use. Even if you can’t stand still for 30 seconds, you can get a quick 10-second scan if you want to just check on the progress of your abs. Plus, consider the alternatives: You’re not gonna break out measuring tapes, calipers, or a water displacement test every day, even if you happen to carry them around in your gym bag. Of course, at $299 plus a $9.99/month subscription fee, or $599 for a lifetime subscription, the ShapeScale is also significantly pricier than measuring tapes or calipers. That’s a hefty chunk of change, but if you’re committed to overhauling your physique—or you really want a more granular look at how your physique is changing over time—then it’s not a bad investment to consider. It also supports multiple users, so both you and your better half can share. The company says it’s designed primarily for personal users, but it will be “able to store data and scans of three to five users,” because of cloud computing costs. ShapeScale’s applications can go beyond aesthetics in the future, too. The technology could have medical applications, enter the realm of augmented reality to help athletes customize gear and perfect their form, and breach the fashion world to show buyers what clothing would look like on an avatar of their body.